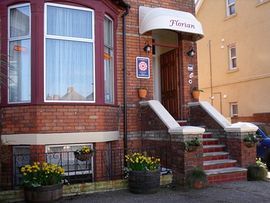 Welcome to The Florian Guest House, which is situated just 10-15 minutes walk from Weymouth town centre and the beach. Weymouth is a traditional seaside town with a long and safe sandy beach. We are well placed for business travellers as we can be reached without going through the town centre and in easy access of all the main business estates. Florian is a traditional Victorian house, on four floors, with car parking at the front and a south facing garden in the rear. 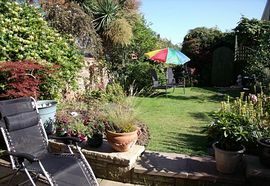 The garden is a great place to sit and relax after a days exploring or to finish your tea after breakfast. We serve the traditional Full English and Continental Breakfasts which can be served early (from 6.30am) for guests travelling on the Cross Channel Ferry or going on fishing/diving trips. We have storage for bikes, windsurfing boards, diving equipment etc. with an outside tap for the rinsing of sports equipment plus drying facilities for wet clothes. For guests walking the South West Coast Path, we can arrange luggage transport. There are six bedrooms arranged on three floors. A large family room on the ground floor. One King/Twin and one spacious double on the 1st floor. On the 2nd floor we have a double, a twin and a single/small double. 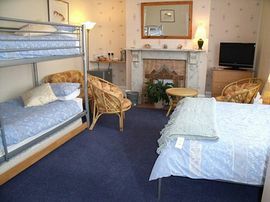 All rooms are en-suite or with private facilities and have TV with DVD player, fridge, hairdryer, radio/alarm clock and tea/coffee tray. There is free wireless Internet access in all rooms. 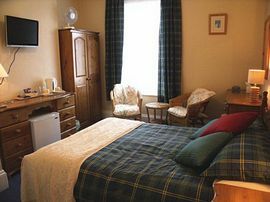 The bedrooms and bathrooms have been recently refurbished and offer a comfortable stay. Keys are provided and guests have access at all times. 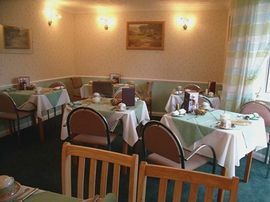 All rooms are serviced daily and Towels/toiletries are provided. While in Weymouth you may like to try fishing. Dave skippers our own Charter Boat 'Atlanta'. This would need to be booked so ask when booking your accommodation. We can arrange short fishing breaks for clubs, or individuals, combining boat and accommodation in one package. Dining room with patio doors into the garden. Pet Facilities: Pets are not allowed. We like pets but our cats don't. Special Diets Provision: Special diets are catered for. We cater for Vegetarian but with a little notice can also cater for Vegan, Dairy and Gluten free. Take the A354 to Weymouth. At Manor roundabout, by Morrisons, take 2nd exit signed to Town & Portland. At Chaffeys roundabout take 1st exit. At junction with lights, turn right into Abbotsbury Road. Straight across junction with lights, St Paul's church on right, Florian 50 yards on left. At roundabout take 1s exit. follow road to seafront. At junction by clock tower turn right. At junction with lights go straight through, over bridge. At junction with lights go straight over into Abbotsbury Road. Straight across junction with lights, St Paul's church on right, Florian 50 yards on left. Family Room can take max of 3 children aged from 2yrs - 13yrs . See our website for details, special offers and on-line booking.